Braised duck is one of my favourite dishes, there are so many different ways of braising including plum sauce duck . 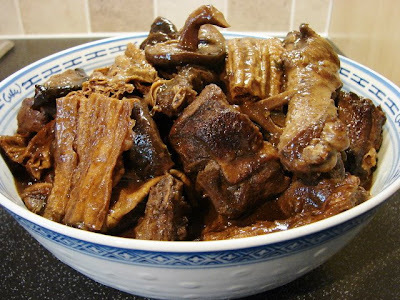 Here is to introduce a very common Cantonese style braised duck with beancurd stick (腐竹fu chook) and Shitake mushrooms. I love beancurd sticks but there is no set standard with manufacturers, some beancurd sticks will soften very quickly after boiling or braising for a short while, other will remain chewy and rubbery even after cooking for a long time. For this recipe I preferred to fry the beancurd sticks first before braising, one is to avoid the chewy texture if it does not soften fairy quickly other main reason is deep frying the beancurd sticks give them a very nice nutty flavour, the texture is very nice too, a bit chewy but not unpleasant. 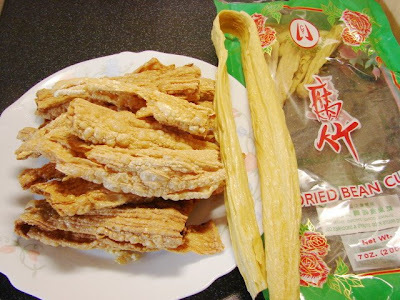 Here is the difference between deep/shallow fried and plain beancurd sticks. Here is the recipe. This will feed 4 -5 with other dishes. First cut the duck into large chunks (they will shrink a lot so don't cut too small) with a cleaver or meat scissors. Then marinate the duck with dark soy sauce and half of the five spice powder, leave aside for 30 min - 1 hour. Soak the mushrooms, clean and cut into thick slices. You can reserve the soaking water for braising. Chop the garlic and shallots. Cut ginger into slices. Get ready the red fermented bean curd. See all the prepared ingredients below. Remove the frying oil. Clean the wok. Add in the ginger, garlic, shallots and star anise, stir fry till fragrant. 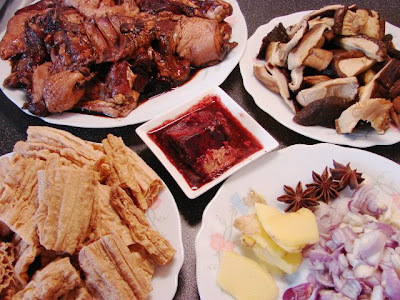 Add in the red fermented bean curd with its juice, mash the beancurd with back of the wooden spoon or any cooking utensil. Stir frying for a minute of two, add in remaining five spice powder, the meat marinate, ground pepper, cooking wine, sugar and light soy. Stir then add in 2 cups of water or mushroom soaking water. Let the mixture come to the boil. Add in the duck pieces and mushrooms. Stir and let the liquid boil again. Then remove most of the scum floating on top. Heat down to low, cover and let it simmer for about 15 minutes then add in fried and soaked beancurd sticks. Continue simmering for about half hour or till the duck pieces are tender. Add in enough oyster sauce to taste. Heat up high and add in the slacken cornflour, stirring and reducing the sauce to the consistency you like. Here is the result. Great with rice and some stir fried vegetables. **With the same recipe, the duck can sub with pork belly, pork hock, pork trotter or spare ribs. Ask the butcher to cut the pork hock/trotter/spare ribs into smaller pieces for you. Meat with bones same weight around 1.3 - 1.5 kg, meat without bones around 900g - 1 kg. Use a bit of cooking oil to brown the meat if not fatty.